Downy mildew caused by Pseudoperonospora cubensis is one of the most important foliar diseases of cucurbits. It occurs worldwide where conditions of temperature and humidity allow its establishment and can result in major losses to cucumber, melon, squash, pumpkin, watermelon, and other cucurbits. Downy mildew can begin to develop at any time during cucurbit crop development in the northeastern US. Fortunately it has occurred sporadically in this region, usually appearing late enough in the growing season that yield is not impacted. Symptoms of Downy mildew are confined to the leaves and their appearance varies widely among cucurbit species. 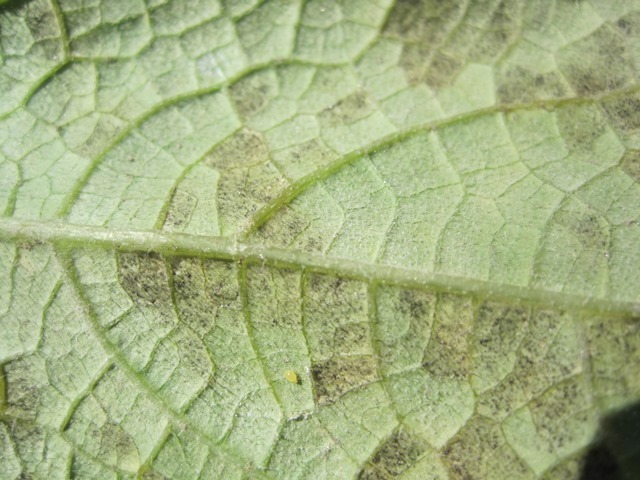 On most species, lesions are first visible on the upper leaf surface as small, irregular to angular, slightly chlorotic areas. Symptoms appear first on older leaves and progress to younger leaves as they expand. When conditions (leaf wetness and humidity) favor sporulation, the production of fruiting bodies (sporangia) on the lower leaf surface gives the undersides of the lesions a downy appearance, varying in color from light gray to deep purple. Lesions can coalesce and result in large areas of dead tissue which exposes the fruit to sunscald. Extensive defoliation can occur when conditions are favorable. Pseudoperonospora cubensis infects only members of the cucurbit family and is an obligate parasite. Its survival depends on the presence of cucurbit hosts, either in climates which permit their growth year round or in greenhouse culture. The source of primary inoculum in cold climates is windblown sporangia from areas where plants survive the cold season. Generally, Downy mildew of cucurbits does not arrive in southern New England until September. However, in some seasons it can move up the eastern seaboard early and arrive in July. 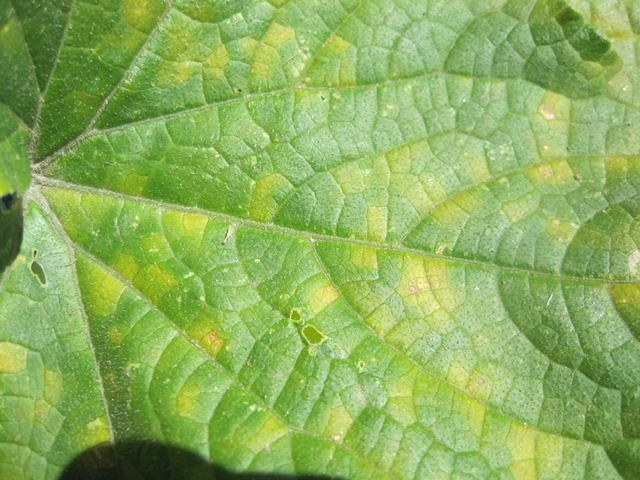 The progress of Downy mildew is tracked by the the Cucurbit Downy Mildew Alert System (http://cdm.ipmpipe.org/). Physiological specialization occurs in P. cubensis and at least five pathotypes have been described. Cucumber and melon are susceptible to all pathotypes, while squash and melon cultivars vary in their reactions. Spread of Downy mildew within a field can be by air currents, rain splash, workers, and tools. Inspect crops weekly for symptoms and have suspect samples confirmed by an extension specialist. Regularly check the UMass Vegetable website (http://ag.umass.edu/vegetable) or Cucurbit Downy Mildew Alert System (http://cdm.ipmpipe.org) for information about Downy mildew occurrence, forecasts, and risks of disease development. The main means of control are fungicide applications, the use of resistant cultivars, and cultural practices. Maximum control can be achieved only with a combination of these measures. Monitor disease occurrence and weather forecasts at http://cdm.ipmpipe.org/. Maximize the distance between cucurbit fields to limit potential inoculum sources. Many commercial cultivars of cucumber have good levels of resistance to Downy Mildew. Watermelon and melon cultivars are available with low levels of resistance. Squash and pumpkin cultivars are resistant to some pathotypes but are very susceptible to compatible pathotypes. See variety tables posted at http://vegetablemdonline.ppath.cornell.edu/Tables/TableList.htm. Use plant spacings which reduce the density of the plant canopy. Avoid overhead irrigation. Both these practices are aimed at minimizing the length of leaf wetness periods. Choose planting sites with good air movement and without shading. Avoid overhead irrigation in early morning when leaves are wet from dew or late in the day when leaves will not have an opportunity to dry before dew forms. Apply broad-spectrum protective fungicides before detection and systemic narrow-spectrum fungicides when downy mildew occurs early in crop production.